Brain Injury Australia has been successful in its bid for $300,000 in funding to “research the prevalence of acquired brain injury among family violence victims and perpetrators” – Recommendation 171 of the Victorian Royal Commission into Family Violence. (“Prevalence” is the number of people in a given area at a specific time with a particular characteristic – in the case of this research, the current proportion of Victorian victims and perpetrators of family violence with a brain injury.) Its Executive Officer, Nick Rushworth, will lead a consortium of Monash University, Domestic Violence Victoria, No To Violence (incorporating the Men’s Referral Service) and the Centre for Excellence in Child and Family Welfare. The research caps years of advocacy that began with 2015’s Brain Injury Awareness Week. That Week’s theme – set by Brain Injury Australia – was women, family violence and traumatic brain injury; the first time that any real public attention had been sought for victims with the disability. The impetus for the Recommendation stems, in part, from Brain Injury Australia’s work on 2015’s national Brain Injury Awareness Week, devoted to women, traumatic brain injury and domestic and family violence. 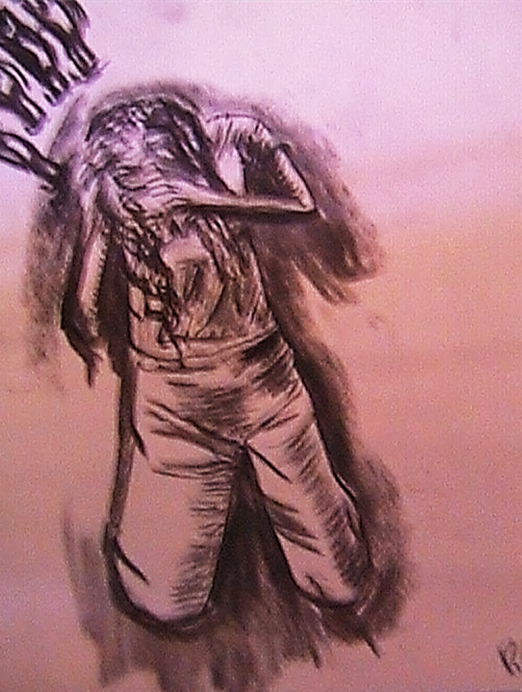 The Week attracted significant media, and other, attention built around the stories of two survivors – 25 year-old Rebecca Sciroli, bashed by her stepfather with a hammer (Rebecca’s artwork about the assault is pictured, above) and Toni Wright, an Aboriginal and Torres Strait Islander woman who sustained a severe brain injury at the hands of her daughter’s boyfriend during a four-hour siege at her home (see ABC TV’s “7:30 [Report]” here, and here). Also as a result of 2015’s Brain Injury Awareness Week, Brain Injury Australia was approached separately by the Manager of Aboriginal Strategy and Engagement NSW for the Australian Red Cross, to become a “foundational stakeholder” in The Studio Gladstone (alongside NSW Aboriginal Affairs’ OCHRE Plan, Kempsey Family Support Services Inc., and Mokea Pty Ltd); a “sustainable, safe and productive place for vulnerable women to heal through cultural practices as therapy, vocational education (art, fashion and creative design) small business development and social enterprise models”. The Studio “seeks to focus on women experiencing ramifications of domestic violence that impact individual capacity, health and wellbeing. NSW Aboriginal women have called for a service that focuses on women with Acquired Brain Injury (ABI).” That the national launch of the Week was held in Geelong, and featured survivors sharing their stories, resulted in the Royal Commission holding a community consultation there soon after. In May, Brain Injury Australia received a “Request for Quote” from the Victorian Department of Health and Human Services to conduct the research entailed in Recommendation 171. Brain Injury Australia’s Executive Officer – Nick Rushworth – will be the “Consortium Lead” and a Director of Brain Injury Australia – Dr. Suzy Goldsmith – will be “Project Lead” on the research. Work has already commenced on the Project and needs to be completed by year’s end. Brain Injury Australia will keep subscribers informed of progress on the research in future newsletters.